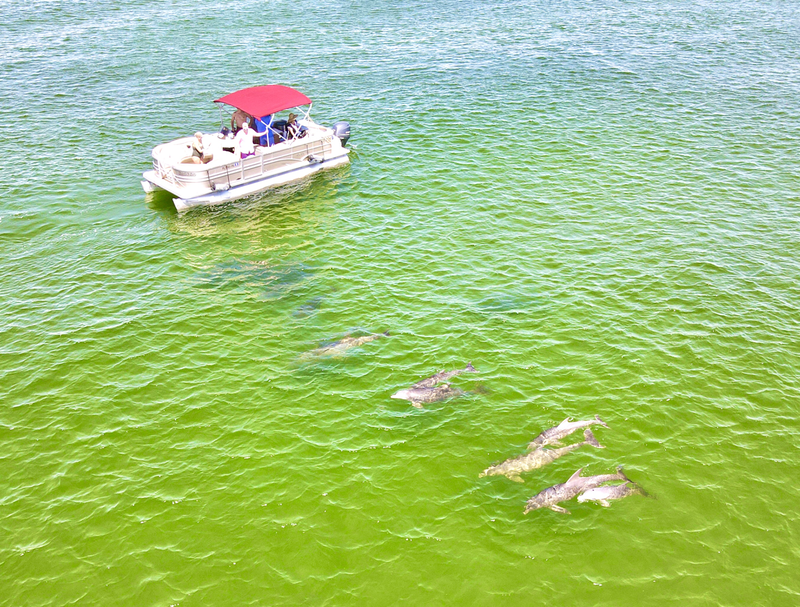 ​Our Captained Pontoon Service Delivers the Real Jewels of the Emerald Coast! and the Elusive Sand Dollars. All at One Very Affordable Price! Mike & Tina, 2 of Bartow County, Ga's finest, are seen in the video to the left, looking into the eyes of a pair of Bottlenose dolphins. 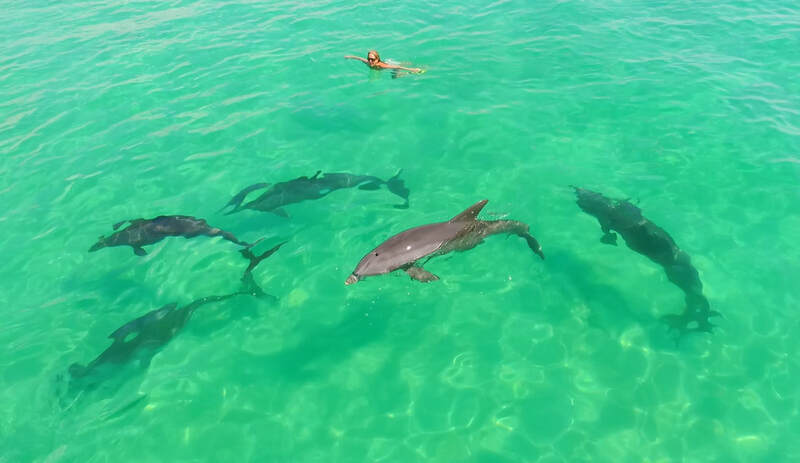 This is what we specialize in, up close, personalized encounters with the vast and abundant marine life that inhabits Destin's incredible Emerald green waters. Snorkel for the elusive Sand Dollars, the East Jetty and the Grass Beds off Santa Rosa Island. We provide all your gear. 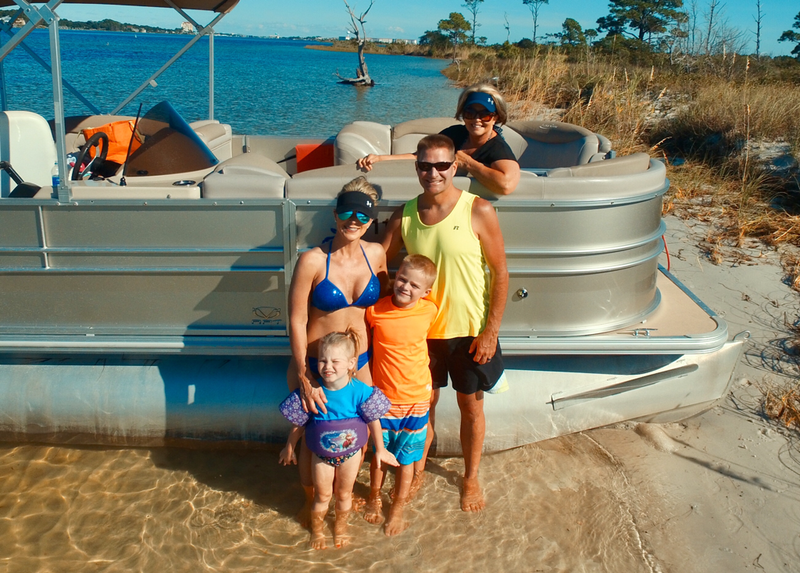 Visit the famous Crab Island and enjoy VIP service from our Captain from boat anchoring front row center at the spot of your choosing, to inflating your multi person floats, serving your beverages from the onboard 110 quart cooler to having your picture and video service film your family from above in 1080 HD! Receive Half Price Admission at the Crab Island Water Park! 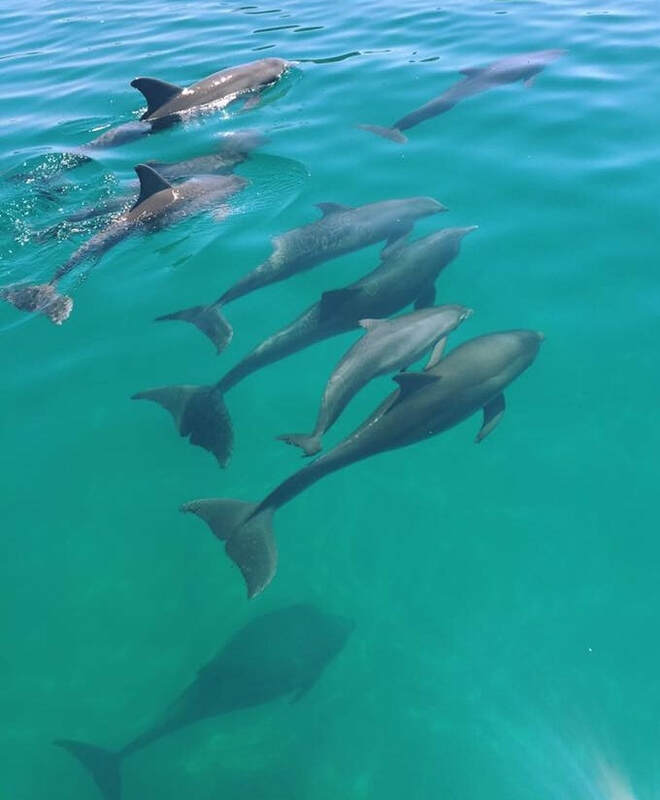 ​Dolphins ​ Our Captain's ensure every party experiences an up close encounter with the Atlantic Bottlenose Dolphins in their natural habitat! Every Charter gets off the boat with at least 15 complimentary Pictures and Video's of your Charter. All shot in 1080p, from heights of 399' all the way down to eye level. We send you home with life long memories you will not forget, nor will we let you! Before you disembark, your party's pics & video's will be airdropped to your phone! Examples can be viewed on "View Our Video's page". -Half Price Admission to Crab Island Water Park! We Know Our Way Around Crab Island Too! The clip below was shot July 2017 during the Gardner family Charter with Captain Shay. Every Charter receives their very own custom video normally before they disembark from their adventure. All included. Not a penny extra for this incredible service! Our pontoon boat Charter, the Hannah Karissa is a 2016 24’ Sylvan with a 115 HP Yamaha Outboard. She is built for both speed and luxury and her ultra soft marine upholstery will invite you in as you prepare for your journey. 16 cup holders provide more than enough hands free beverage holders for everyone and her 110 Quart Cooler comes stocked with ice and bottled water. You bring WHATEVER beverages you would like, glass is acceptable. Also onboard is an in-helm digital Garmin GPS Fishfinder, trim guage, speedometer tachometer and mood lighting. The Custom 4 Speaker Jensen Marine Stereo allows you to connect via Bluetooth, so any of the occupants can be the DJ right from their own mobile device! Of course all the Coast Guard required safety equipment including PFD’s for all sizes and ages. The Best Activity in Destin, Fl. ​From your initial email or phone call, you will notice the difference as we go great lengths to maximize your experience on Destin’s Emerald waters. From explaining the tide schedule and how it effect’s the water clarity to customizing each Charter to fit the needs of the families involved, we leave no task undone to ensure your time with us will be the best of your vacation! Pro Snorkel, Masks provided as well as Multi Person inflatable Floats ( see pic below ), 2 person Towable Tube, Bottled Water on Ice all come complimentary with our Chartered Captain Service. Where Quality & Service still lives!